LONDON - It's been almost two decades since BT's "It's Good To Talk" commercials hit the screen. Robert Bean, who worked for both WCRS and BT on the account, tells the story behind the successful campaign. In the milky sunlight streaming through the tall windows of an office off Fleet Street, the air was thick with purple cigar smoke. A presentation led by Adrian Hosford, BT’s Director of Communications, had just ended. It was a meeting that would alter BT’s fortunes. After months of intensive work, Adrian and Norman Strauss, an outstanding brand strategist, had triumphantly informed the team of senior BT executives that they weren’t really in the telephony business. Nor were they in the technology business. Nor were they even in the business of exploiting the country’s largest installer base. But over time it started to not only make sense, but also grow as a thought of such immense power that it would become the focal point for all of BT’s consumer advertising. The basis of reciprocating confidences was that the exchange of ‘confidences’ between human beings leads to better communications and, in turn, deeper relationships. What a simple, big, brilliant and market re-defining thought. They’d put their arms around the very essence of communications and claimed it as their own. BT really could be about improving relationships through enabling the ‘reciprocation of confidences’. Quite an important discovery for the phone company. But it was time to make ‘reciprocated confidences’ meaningful for consumers too. In the showpiece pitch that followed, Abbott Mead Vickers BBDO won the business in a performance from David Abbott that was as good as any thespian or political leader. The brief was far from simple. With 67 per cent market share and no significant category competitor, it was fundamentally about changing attitudes towards communications. In particular, it was about changing the attitudes of the (male) bill-paying gatekeeper. Women were BT’s heavy users and naturally more disposed to reciprocate confidences with friends and families. It was the blokes who didn’t do it. And who didn’t approve of it being done. But it also had to be an idea big enough to house the vast array of BT’s products and services, as well as build as a campaign. Individual call stimulation successes wouldn’t be enough. Given that the last precedent for this brief was Maureen Lipman/ Beattie, the stakes were high. AMV’s response to the briefing document that had taken months to prepare and was measurable by its weight, running as it did to several inches deep, was four simple but unforgettable words: It’s good to talk. 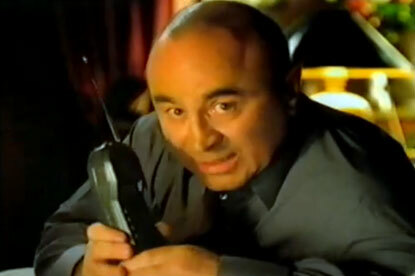 Not satisfied with the brilliant simplicity of the line, they also wrapped up the whole campaign by employing Bob Hoskins to deliver it in his inimitable macho Cockney style, thus talking directly to the blokes. With scientific Stephen Hawking previously on air in a big corporate commercial, and bruiser Hoskins now telling the world that ‘It’s Good to Talk,’ we had people either unable to, or not known for their ability to communicate, celebrating the virtues of communication. It all had a wonderful circular inner logic. The facts speak for themselves; the campaign delivered BT an incremental £5 billion over the five years it ran, an astonishing result and true testament to the power of good communications. David’s brilliance at condensing such complexities into four seemingly innocuous words made me re-think the true nature of creativity. The common perception is that creativity is an expansionist process, with the artist adding layer on layer of depth and subtlety, ultimately creating something of such profundity and wonder that we, the creatively stifled, can do little more than marvel at it. And that’s exciting when it happens. But I want to make the case for the reductivist. That brutal, ruthless, editorially-minded, scythe-wielding seeker of the Fundamental Truth. The absorber, truncater, stripper and reconstituter of information that was previously confusing for the rest of us yet, in his grasp, is reduced into something not just meaningful but compelling too. What an act of equal creative genius. What a woefully under appreciated, under acknowledged and under-valued form of creativity. David’s four little words helped BT lose its ‘Britain’s Most Hated Company’ tag, and it entered into the common vernacular. Now, more than 20 years later, the sentiment remains as true as ever. This article is adapted from Robert Bean’s book Winning in Your Own Way: The Nine and a half Golden Rules of Branding published by Management Books 2000 at £14.99.